This past weekend over at The Phillies Room, Jim’s post about Jason Giambi’s 3-HR night against the Phils on Thursday night inspired a quick exchange about the fact that Phillies seem to have a history of employing the wrong brother. Whether the name is DiMaggio, Torre, Brett, Maddux or Giambi, the Phillies always seemed to employ the lesser ballplayer. Given that Phillies played the Rangers this past weekend, my plan was to post the 1989 Topps Big card of Rangers pitching coach Mike Maddux, who has built quite the coaching career while his younger brother put together an amazing Hall of Fame resume. Alas, thinking that there was no way I was going to post that particular Maddux card, Jim made that the featured card of his post last night. Now, a person less familiar with team history and with a smaller Phillies collection to exploit might have panicked and just used Maddux’s 1985 Tastykake rookie card (which he shared with Rodger Cole) instead. 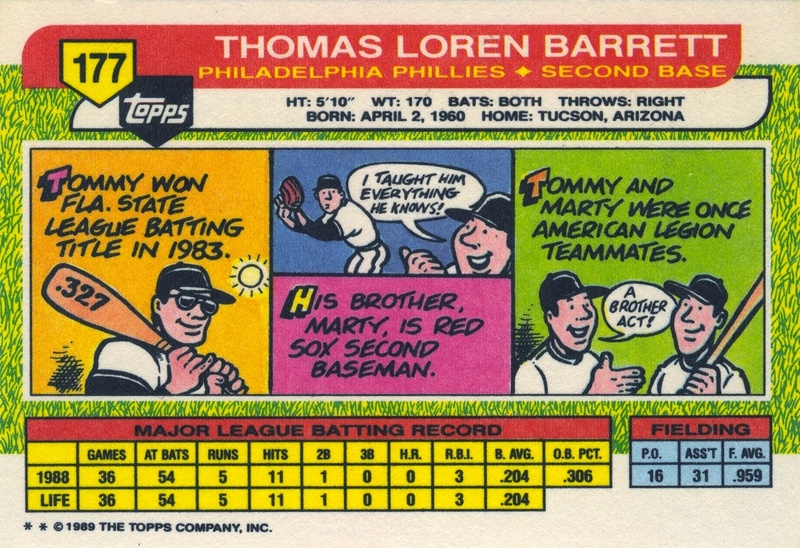 But no, I decided to go a different route and highlight another card from the 1989 Topps Big Set featuring another wrong brother in the Phillies employ — that’s right, the Phillies simultaneously carried two wrong brothers at the same time in the late ’80s: Maddux and Tom Barrett. 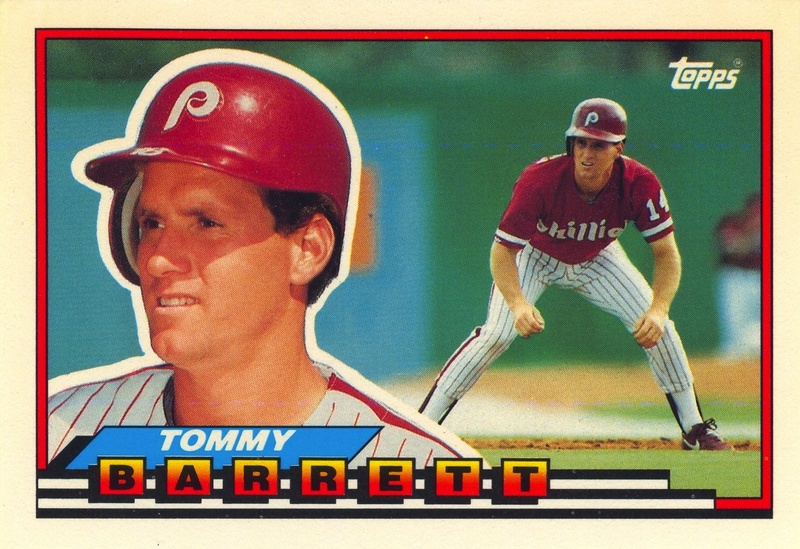 Okay, of the brothers mentioned thus far, Tom Barrett might be the biggest stretch when comparing big league brothers. His brother Marty was just your typical light hitting, good fielding second baseman, but he was a good enough to enjoy a 10-year career in the majors. Tom, however, was both light hitting and below average with his glove. Luckily for him, when he was ready for the majors, the Phillies were racing for the bottom of the standings. Otherwise, there’s little reason to believe that Barrett would have been given the opportunity to compile the .210/.289/.222 slash line he gave the Phils during the 1988 & 1989 seasons. I’ve always had a soft spot for the Topps Big issues because Topps was attempting to harken back to its vintage 1955 and 1956 designs without going into the full-bore recycle mode that marks its Heritage offerings. Topps successfully did this with the fronts of its 1983 and 1987 sets (which harkened back to the 1963 and 1962 sets, respectively), but this was the first time they attempted to do this on both sides of the card. Clearly, given that they were only issued for two years, the Big brand never caught on. I’m guessing that the biggest issue with them was that they were also sized like the ’55 and ’56 sets. Topps must have felt this too — in 1989, they also revived the Bowman line and used the same card dimensions for it as the Big issues. However, when the new decade started, Bowman shrunk to standard card dimensions and the Big line was axed. Barrett’s brief time with the Phillies was finished as well.